At the beginning of December, my cousin Dustin came to visit from San Diego. Dustin is the executive chef at Catania, an Italian restaurant in La Jolla, California. We thought when he came to visit he would want a break from cooking, but he insisted on cooking our entire family a 5 course dinner. As I watched in awe as he rolled pasta by hand, chopped vegetables at the speed of light, and cooked everything simply off the top of his head, not only did I learn a lot, but I got to sample everything a long the way. (Perks of spending time in the kitchen, eh?) My favorite dish I tried from the evening was what I deemed Cauliflower Mousse, although I didn’t catch what he officially called it. 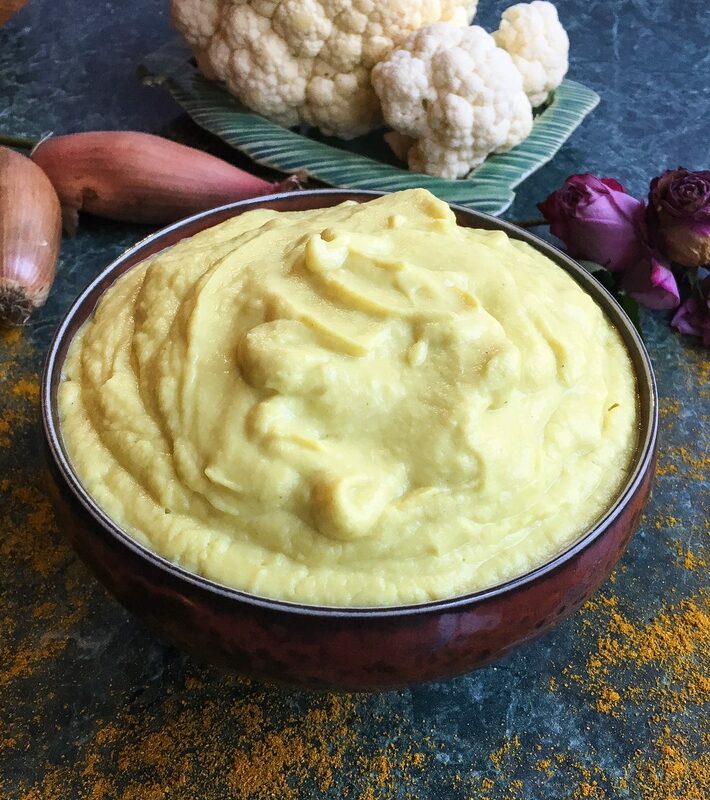 As soon as you take a bite of this dish, you will understand exactly why I call it Cauliflower Mousse. It’s rich, creamy, frothy…yet simultaneously surprisingly light. It literally melts on your tongue. It’s so comforting and satiating, you feel like you’re indulging in something decadent like Mac n’ Cheese, yet it’s pure vegetables- making it low in calories and high in nutrients. From the moment I tasted this, I knew I had to recreate it. My cousin was going to jot down his recipe, but he left without doing so, and I’ve discovered it’s really hard to pin down an executive chef who lives across the country, ya know? So, I went off my memory of the flavor, playing with ingredients, and I’m proud to say I NAILED IT! This tastes just like the original. Cauliflower is one of the healthiest cruciferous vegetables, ranking in the top 20 in terms of its ANDI score (Aggregate Nutrient Density Index) that rates food in vitamin, mineral and phytonutrient content when compared to caloric density. This vegetables provides 77% of your daily vitamin C needs, along with being high in fiber and providing vitamin K, protein, thiamin, riboflavin, niacin, magnesium, phosphorus, fiber, vitamin B6, folate, pantothenic acid, potassium, and manganese. 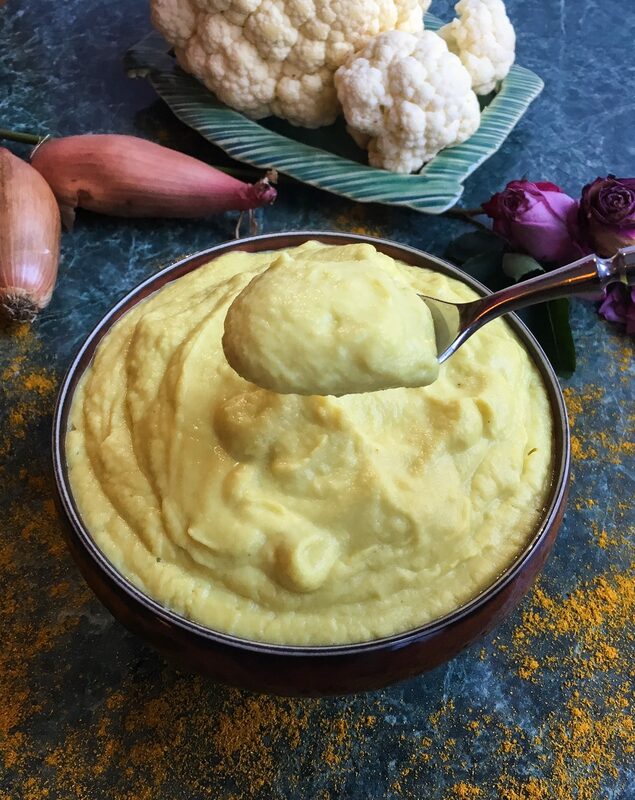 Cauliflower has also been under research for it’s ability to prevent cancer as an anti-inflammatory and because it contains sulforaphane, a sulfur compound that has also been shown to kill cancer stem cells, thus slowing tumor growth. 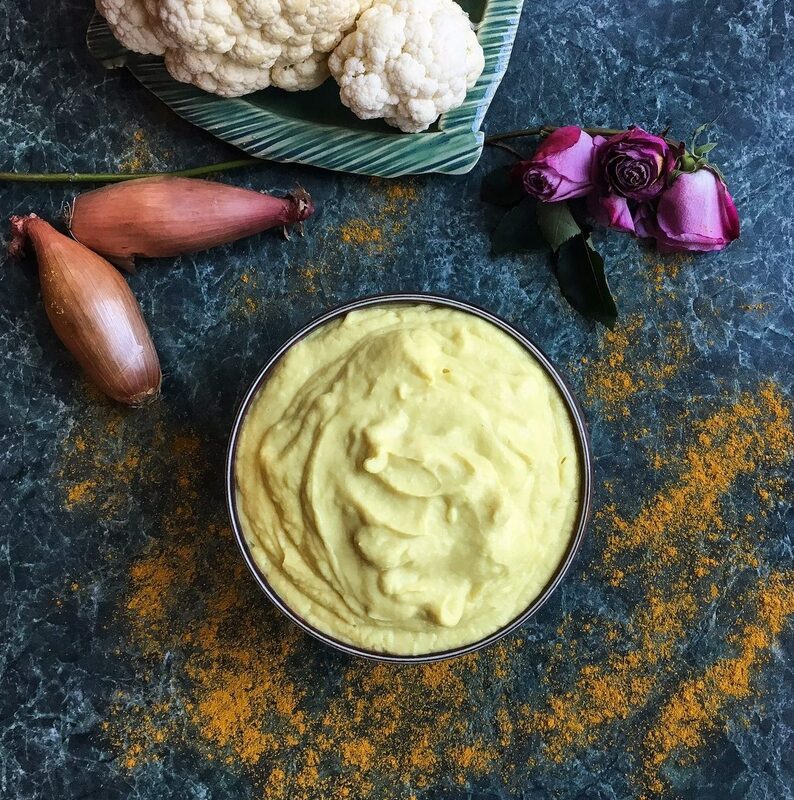 Cauliflower Mousse is the absolute perfect side dish or snack for this time of year when we’re all trying to lighten up our diets after the holiday season. Dishes like this are always what I use when I’m trying to cut calories, because it tastes decadent to the taste buds, but is light on the waist! It’s super easy to make, so be sure to snag these ingredients at the store this week and add it to your meal plan! Heat a large pot of water until it comes to a boil. Meanwhile, preheat a small skillet with 1/2 T olive oil while you peel and dice the shallots. Add the shallots to the pan and cook over medium-low heat until lightly caramelized. Once the water comes to boil, add the cauliflower florets and cook 10-15 minutes, until a fork very easily pierces. Drain the cauliflower then add it to a blender, with the remaining 1 1/2T olive oil, cooked shallots, milk, and spices. Use the “puree” or “liquify” setting to blend until very very smooth and fluffy (2-3 minutes), adding more milk 1T at a time (or olive oil 1/2T at a time) until frothy. Serve warm.